Yes, I was kindly sent another product to review.. and yes I scared the postman with my excitement on receiving the package! 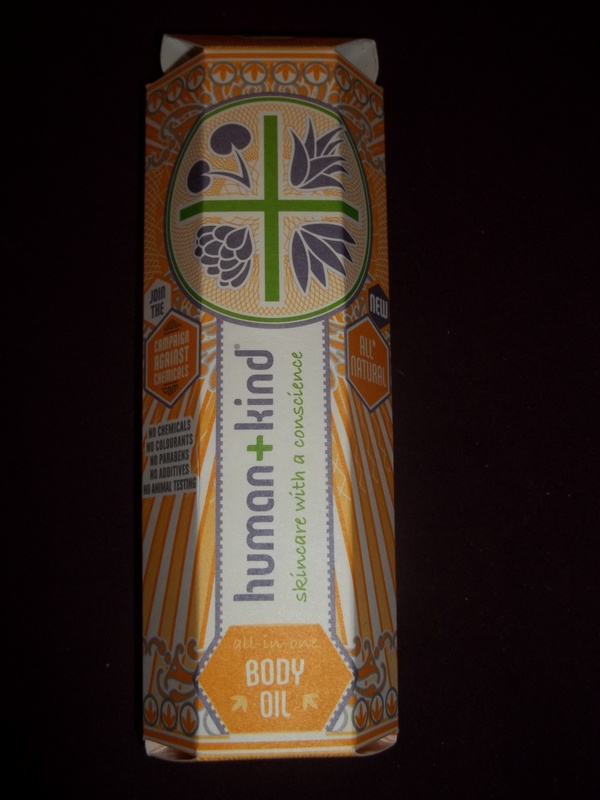 Today’s product is from a new company to me, irish-based company “Human + Kind”. I’ve personally never used any of their products before but I have heard the name going around various blogs and I’ve always been curious to try them out! – All products are dermalogically tested- major bonus points in my books! – All products are allergy screened and are suitable for sensitive skins… This is one of the facts that won me over most! Now that I’ve covered the background to the creators of this product, I guess I should actually introduce the product properly. 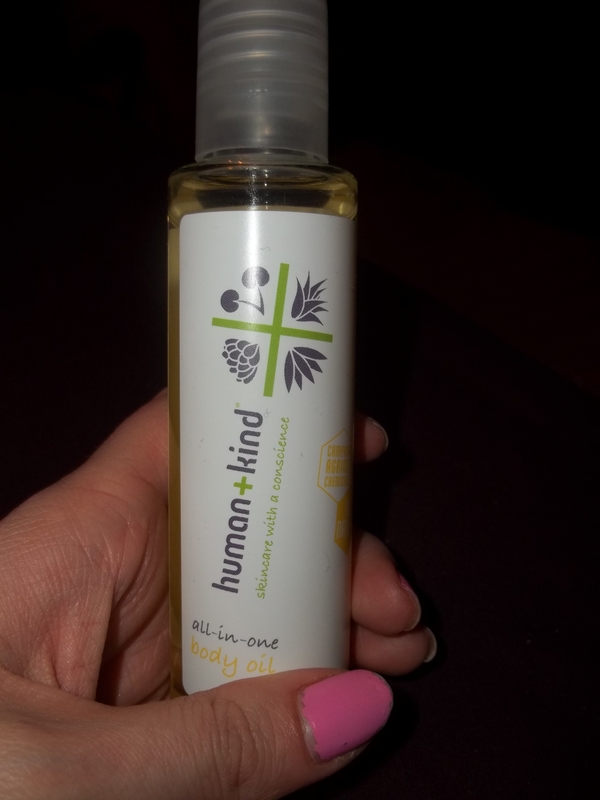 As the title states, today I shall be reviewing their All-in-one body oil. Now i’m the kind of girl who is often (even though probably wrongly) swayed by first impressions.. and with this product, this meant, love at first sight! The packaging alone pretty much won me over straight-away with its almost retro/hippy-eque style. Now, as you may know if you’ve read any of my other posts, I have ridiculously sensitive skin, so when I buy/receive new skin products, I’m always quite nervous to try them out on my skin. 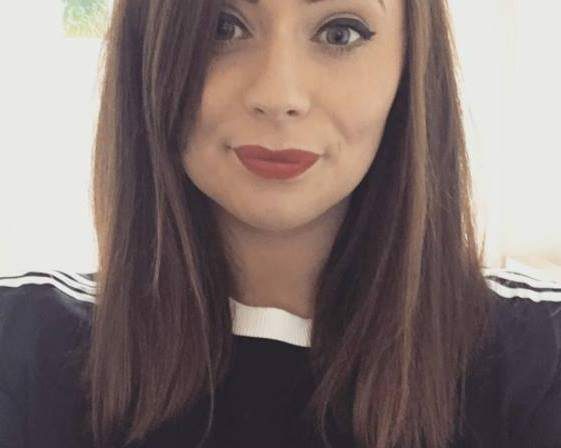 I also suffer from eczema so I need to be pretty careful not to aggravate that as well! As the name states it’s an ” all-in-one” product so you can use it everywhere- hair, face and body. I have a pretty strict face skin care regime so I didn’t try it out on my face but I have used it on my body… and guys its UNREAL! Like most products on the shelves these days… they all claim to do or improve, cure etc. certain flaws or ailments. However they don’t always fulfil these claims/promises! So i decided to investigate if this product lives up to its responsibilities!! Non-greasy and rapidly absorbing: CHECK! – I was actually surprised about this.. being an oil-based product, I was sure that this product would be very oily and that it would linger on the skin for quite a while.. however the outcome was the complete opposite. My skin felt super moisturised and glowing just after one application. I will say though, if you do have oily skin, I would avoid applying this to your face.. as it could only enhance the oiliness! reduce the appearance of stretch marks: UNSURE: I’m afraid this is something I can’t confirm as I luckily don’t have any stretch marks.If any of you out there have tried this on your stretch marks.. id love if you could let me know if it was effective! highly affective for ageing or dehydrated skin: UNSURE: Again.. as I’m only 21 years old.. this doesn’t really qualify me for ageing skin. However, all I do know is that, the older you get, the drier your skin gets and a stronger moisturiser is needed to keep it hydrated and young and plump looking. This product seems perfect for this… but I can’t say for sure! soothes and softens skin after shaving: CHECK I actually applied this to my legs after shaving and I have to say, it felt really nice and soothing.. it almost had a sort of cooling affect on my skin and I found that after applying this, any irritation that i would normally get after shaving (damn sensitive skin!) was completely gone…which I was amazed at! helps improve appearance of damaged skin: CHECK: In regards to eczema, i can definitely say yes. a few days ago, my eczema flared up pretty bad due to stress.. I thought i’d try this oil out just to see if it helped at all. And it really did.. not only did it control the itching but after about an hour any redness was significantly reduced! This is a huge thing for me when it comes to products so this point alone has won me over! That’s all for now guys! 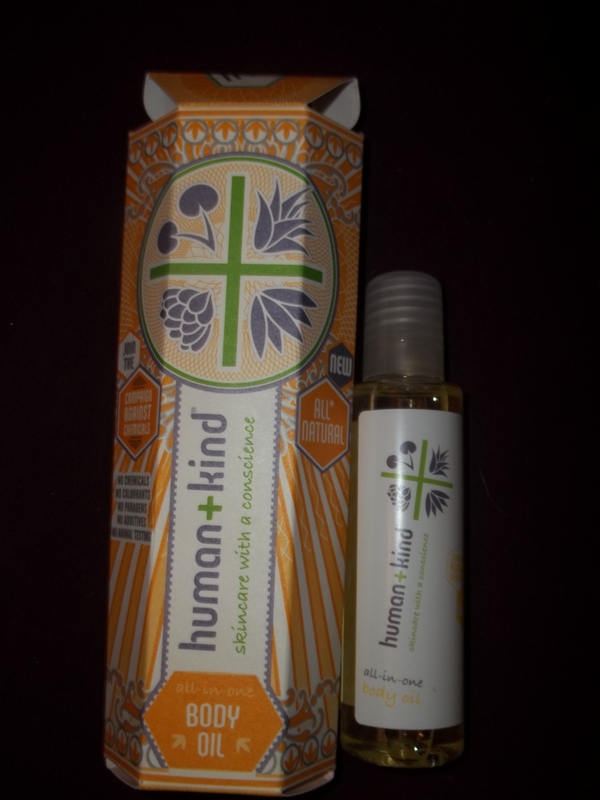 I hope you enjoyed this review, make sure you visit their website http://www.humanandkind.com to check out more of their yummy irish products! And if you enjoyed this review, stay tuned for two reviews I have coming your way: the John Frieda “3 Day Straight” hair straightening spray and Sally Hansen’s Double Duty strengthening base & top coat nail polish! Let me know if you have any requests or suggestions of posts you’d like me to do! I love to hear any of your feedback! Great review this sounds like a really promising product! just finished talking about oils in one of my discussion on LinkedIn. A friend bought an Ayurveda oil from Dubai that claims to renew wrinkles, dryness and tackle cellulite. unfortunately for her, her face broke out but it was good on her body. I love oils too…nourishing ones with ingredients that heals…so me and my group members are looking at OILS and why most FACES go to WAR with oils. If anyone is into nutritive facial oils here i would like to get some samples for Evaluation and review too. Good gist here my friend!